Det sägs att de vilda djuren aldrig går vilse, inte heller bryr de sig särskilt om gränser, varken de synbara eller de mer abstrakta. Men vi andra reflekterar över dem i varierande grad. Treriksrøysa, meeting point for the borders between Finland-Norway-Russia also the only land based point where three seperate timezones interlock. 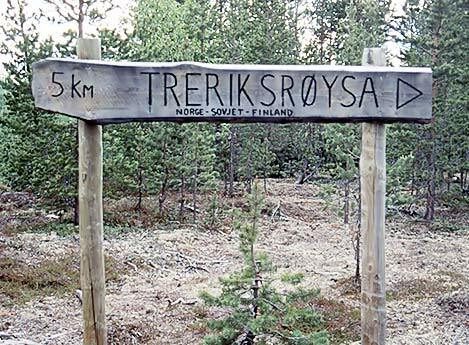 WARNING: Crossing into Russia from Norway or Finland if walking around the border post/markings is illegal. It's also illegal to intentially make contact towards persons on the other side of the border, or behave in an provocative manor (urinating from either Norway or Finland into Russia, mooning towards borderguards on the other side, etc..) in the vicinity of the border, and to photograph with photo objectives over a certain size. Military borderguards from all three countries monitor the frontier 24/7 and have police powers and jurisdiction both over civilians and military personnel in the border areas. Border violation may be penalised with either imprisonment or high fines. Contact local turist board for do's and dont's when traveling along the border. Kolla in bilder här. Bläddra med piltangenter.